I try to avoid taking my partner when I go plant shopping. Mostly because I usually plan on piling plants in the space where he would be sitting in the car -- but also because he gets so confused as I walk past apparently lovely plants without even glancing and then go into hysterics over some strange little spiny thing. 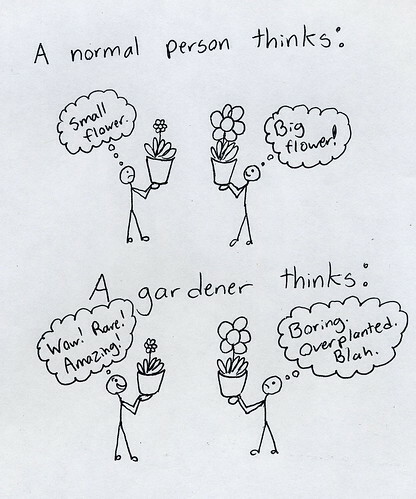 Gardeners are very strange people. Hi Joseph, Cute and true - I do think you start to see things differently after enough (too much?) time with plants. LOL - yep. It's said that the mark of a mature gardener is the appreciation of foliage over flowers. This is part of the same continuum. It is national campanula week! Back by popular demand: Drawings!